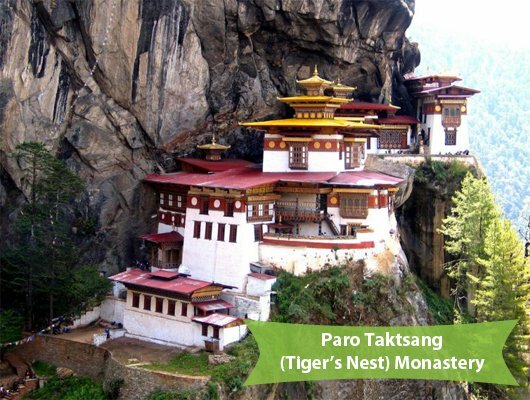 Built in 1692, Tiger’s Nest is situated in upper Paro Valley’s cliffside. Tiger’s Nest Monastery is believed to be the birthplace of Buddhism in Bhutan, making it the most sacred monastery in the country. Tiger’s Nest is quite similar to the other monasteries in Bhutan, but it has two unique features – the trek leading to the monastery and the tiger nest cave. Its spiritual significance and natural beauty are also worth to mention. Guru Padmasambhava, popularly known as Guru Rinpoche visited and sanctified Bhutan in the 8th century when evil spirits abounded and harmed people. Legend has it that Guru Rinpoche flew to this site on a tigress’ back to subdue a local demon. Thereafter, he meditated here for three months. The pilgrimage to Taktsang is the ultimate destination of any pilgrim traveling to Bhutan. It sits 3,000 feet above the Paro valley, the western part of the kingdom. You can reach there by two ways – hiking all the way up or riding a horse up to a certain point and then hike from there. The monastery has four main temples and residential shelters. Eight caves are there and four are fairly easy to access. The buildings are interconnected through rock stairways and steps with a few wooden bridges. Rinphung Dzong was consecrated in 1645 by Shabdrung Nawang Namgyal on the site of smaller fort. Throughout the 17th and 18th centuries it served as a bastion against invasion from the north. It is regarded as one of the finest Bhutanese architecture - with intricate wood work, large beams slotted into each other and held together without nails. The dzong is also known as Paro Rinpung Dzong – “the fortress of the heap of jewels”. It survived a massive earthquake in 1897 although it was destroyed by fire in 1906. Rinpung Dzong is a large dzong - Buddhist monastery and fortress - of the Drukpa Lineage of the Kagyu school in Paro District, Bhutan. Paro Dzong's full name is Ringpung Dzong, which means 'the fortress of the heap of jewels'. In the 15th century, two brothers (descendants of Phajo Drugom Zippo, the founder of the Drukpa Kagyupa School in Bhutan) named Gyelchok and Gyelzom lived in the Paro valley. Gyelzom established himself at Gantakha Monastery; his brother Gyelchok travelled to Tibet to study theology. When Gyelchok came back to Paro, he was not respected in the community due to the many years he had spent studying without any money. His brother Gyelzom, renounced his existence, in his eyes a "beggar" could not be part of the family. Tashichhoedzong is a Buddhist monastery and fortress on the northern edge of the city of Thimpu in Bhutan, on the western bank of the Wang Chu. It has traditionally been the seat of the Druk Desi (or "Dharma Raja"), the head of Bhutan's civil government, an office which has been combined with the kingship since the creation of the monarchy in 1907, and summer capital of the country. 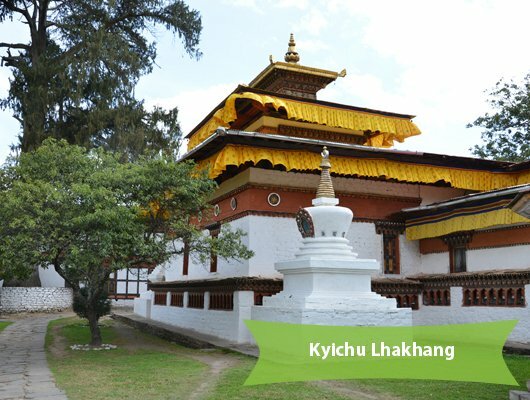 It was built by the first Dharma Raja, who also founded the Lho-drukpa sect of Buddhism, which has remained the distinctive sect of Bhutan.The Taschichho Dzong was built in the late 1700's and also serves as the home of the Central Monastic Body. The building we see today is largely a modern affair, built in 1962 when His Majesty Jigme Dorji Wangchuk moved the government to Thimphu after a fire at its original location. Tashichhodzong houses the main secretariat building, throne room of His Majesty the King of Bhutan. During the warmer summer months the monk body headed by His Holiness, the Je Khenpo, makes its home in the dzong. West of the dzong is a small tower of Ney Khang Lhakhang which houses a statue of Shakyamuni Buddha and protective deities. The Gangteng Monastery generally known as Gangtey Gonpa or Gangtey Monastery, is an important monastery of Nyingmapa school of Buddhism, the main seat of the Pema Lingpa tradition. Located in the Wangdue Phodrang District in central Bhutan. The Monastery, also known by the Gangten village that surrounds it, is in the Phobjikha Valley where winter visitors – the black-necked cranes – visit central Bhutan to roost, circling the monastery three times on arrival and repeating this circling when returning to Tibet. The Monastery's history traces to the early 17th century and back to the prophecies made by the well-known Terton (treasure finder) Pema Lingpa in the late 15th century. The site of Gangteng Gonpa had been chosen by Pema Lingpa himself. Construction of the monastery was begun in the early 1500s by Pema Lingpa’s grandson, the first Gangteng Tulku, and the present form of the monastery was completed later that century by the 2nd Gangteng Tulku. The monastery’s name, attributed to Pema Lingpa, is simple and appropriate: “top of the hill.” Gangteng Gonpa is presently the largest private Nyingma monastery in the entire Kingdom of Bhutan. 14 km from Paro, Drukgyel Dzong was built in 1647 or 1649 at a strategic location to control the routes to Tibet. Shabdrung Ngawang Namgyel built Druk Gyal Dzong, just north of Taktshang, to commemorate the victory over the Tibetans in 1644 and the unification of Bhutan. The name ‘Druk Gyal’ means ‘Fortress of the Victorious Drukpa’. In 1951, the dzong was destroyed by the fire and is closed to all visitors since then. The ancient ruin of Drukgyel Dzong is the ruined site famous for its strong association with heritage and Bhutanese culture. Located on a ridge in the upper Paro valley, the heritage site served as an important base for defense in the region until 1951. Jhomolhari Mountain, the abode and embodiment of the Mountain Goddess Tsheringma who watches over the land, forms the backdrop of Drukgyel dzong. Shabdrung arrive in Bhutan in 1616 but the Tibetan ruler was not content with his biggest enemy leaving Tibet and living in Bhutan and was determined to destroy him. Thus, he attacked Bhutan. There are some interesting legends connected to Druk Gyal Dzong. Once the invading Tibetans saw the dzong from the vantage point of Sagala and thought that it was attached to the spur of Jana, a hilltop in that direction but when they reached there the Drukgyel dzong was still further away and everything seemed like a mirage to them. Kyichu Lhakhang is a Buddhist temple in Paro. 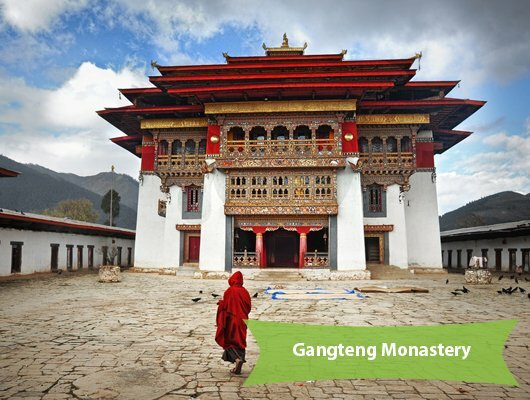 It is one of the oldest monasteries in the country built in the 7th century by the Tibetan King Songsten Gampo. Kyichu is said to be one of the main 12 temples of the 108 temples that were built overnight across Tibet and borderlands. The temple was adopted by different sects and many important Buddhists teachers spent time here and unearthed concealed teachings. The inner hall of the main Jowo Lhakhang shrine conceals the original 7th century Jowo Jamba Statue. Its central image of Jowo Jamba is flanked by eight standing bodhisattvas and by statue of Zhabdrung and Guru Rinpoche. According to legend, the King built all 108 Lhakhangs over the body of a giant demoness to pin her on the earth forever. The Lhakhangs were built on her body parts spanning Bhutan, Tibet and border areas. The Jambay Lhakhang Drup is one of the most unique and different festivals of Bhutan. The most popular and legendary Tercham (Dance of Treasure) is performed during the festival. The dancers perform the dance completely naked wearing only a mask around a bonfire. It is believed that witnessing this dance blesses infertile men and women with children. This dance is performed only at night. Located on a stretch of land where the Pho chhu and Mo chhu converge, the Punakha dzong served as the centre of government and the first session of the National Assembly was also held here in 1953. Punakha was the first capital of Bhutan and the country’s first king was crowned here in 1907. The Palace of Great Bliss or Punthang Dechen Phodrang in Bhutan is commonly known as Punakha Dzong from other parts of the world. This amazing and historical palace has been built during the 1600s and has already been renovated several times after certain calamities. Dzongs are quite common in Bhutan since they are being ruled by kings. However, Punakha Dzong is quite different from the rest because of its gigantic size and also because of its great involvement to Bhutan’s history. In the 8th century, Guru Rinpoche had prophesied that a young man named Namgyel would come to a mountain that appeared like a sleeping elephant and build a dzong upon the elephant’s trunk. To fulfill this prophecy, Zhabdrung commissioned Zow Balep, a carpenter to construct the dzong in 1637. Punakha Tshechu is the special religious and historical festival of Punakha held on auspicious days once a year. The festival usually happens in the spring. There is nothing like it if you can time your visit with this colourful festival. 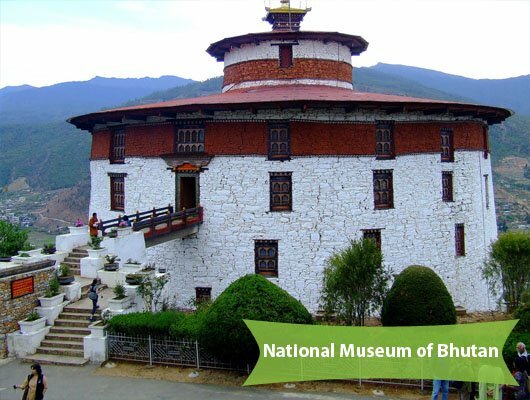 The National Museum of Bhutan is among the few educational institutions that interpret the history and culture of Bhutan through its exhibits, conducting symposiums, publication of research findings and conservation of artifacts. Opened to the public in 1968, the National Museum of Bhutan in Ta Dzong at Paro has over 3000 artworks and masterpieces that display more than 1500 years of cultural heritage of Bhutan. These art works speak of various disciplines of arts and crafts in Bhutan and the various Bhutanese creative traditions. You can see an eclectic mix of past and present art forms here along with a glimpse of future of the Bhutan’s traditional arts. It is a must visit for all local and foreign visitors to Bhutan. His Majesty, King Jigme Dorji Wangchuck, the third hereditary monarch of Bhutan, renovated the ancient Ta-dzong building and created the necessary infrastructure based on scientific lines to display some of the finest specimens of art, bronze and paintings in Bhutan. Today the National Museum has in its possession over 3,000 works of Bhutanese art, covering more than 1,500 years of Bhutan's cultural heritage. Its rich holdings of various creative traditions and disciplines, represent a remarkable blend of the past with the present and is a major attraction for local and foreign visitors. Dechen Phrodrang meaning "Palace of Great Bliss" is a Buddhist monastery in Thimphu, Bhutan. It is located to the north of the city. In 1971 it became a monastic school and currently it has 450 student monks enrolled in eight-year courses with a staff of 15. The monastery contains a number of important historical Bhutanese artifacts including 12th century paintings monitored by UNESCO and a noted statue of Shabdrung Ngawang Namgyal on the upper floor. In the downstairs chapel, there is a central Sakyamuni Buddha. At the end of Gaden Lam is the Dechen Phodrang, the site of Thimphu’s original dzong. Since 1971 it has been the state monastic school, where an eight-year course to almost 500 monk students is provided. The 12 century paintings in the monastery’s Guru Lhakhang have been restored and the upper floor features a large figure of Zhabdrung Ngawang Namgyal as well as a goenkhang (chapel dedicated to protective deities and only men are allowed inside it). Dechen Phodrang literally means palace of the great bliss.